My last blog of 2014 is an ode to the colorful world we live in. Everywhere I look, I see inspiration for creativity. I find it so exciting to try to see even the most mundane objects of our daily lives as sources of joy. Anybody who likes to create something new and innovative - fashion designers, writers, artists, performers, cooks - makes it a point to soak up their surroundings and to let them change them. This is how new ideas are born. I often set a small challenge for myself to ensure that I keep my eyes open and that I keep changing as a fashion designer. So, I decided to use random objects (mostly things I found in magazines) as the driving force for my design work. Everyday, I would look for an item that would prompt me to do a quick sketch of a dress or other piece of clothing. It was a wonderful experience - within minutes of locating the image (such as a watch or a fancy pen), my brain would be firing ideas and my hand would be moving across the blank paper. Take a look below at what I came up with - the objects affected the color scheme, the silhouette, and the type of garment. A vacuum cleaner, as it turns out, is a good inspiration for a dress. A make-up face stick can be inspiration for a coat sleeve. I wish you all an inspiring 2015! I hope that you will find tons of joy in your lives and that your creativity will reflect the wonderful and colorful world of ours. By the sea. Portugal. August, 2014. Evening coat by Jeanne Lanvin of the House of Lanvin. Spring/Summer 1927. I enjoy visiting art galleries and watching documentaries on art. There is so much out there to learn about! And we are so lucky to have such easy access to wonderful museums and movies about art history. As Henri Matisse is one of my favorite artists, I recently made it a point to see his cut-outs and other works at the Museum of Modern Art (MOMA) in New York City. MOMA houses "The Red Studio" (1911), which I adore. This is a large piece and as you walk up to it, you will get lost in a see of red. While using one color could cause a painting feel flat, it is not the case. Matisse invites us into his work space with a bold statement of intense red and many others colors spread around the room. If you are unable to travel to New York City to see this artwork, I recommend watching "Modern Masters - Henri Matisse" on YouTube. At minute 29, you will be taken to see The Red Studio and the commentary about it is just lovely. You will learn tons about the artist and his wonderful willingness to share his experience with us with such determination and vulnerability. So, if you can see this piece, see it in person. If you cannot, don't despair and check out the many great documentaries online. The world of art awaits to be discovered! Photograph of Henri Matisse's painting by Martina Sestakova. New York City, NY. November, 2014. During my studies at the Academy of Arts University I have been focusing on improving my fashion illustration skills. This is a field of illustration with very specific requirements. The figure is 10 heads tall instead of the 8-head figure that reflects the natural human shape; the body is elongated to show off the garments and fabrics. It is all about mood and attitude and conveying a fashion's designer's idea. I recently discovered an art class at a local community college and got into sketching based on a real model. What an experience! Very different from drawing a static figure and focusing on fabric textures. This class is all about a quick sketch and my ability to capture the model's pose with a few strokes. As the models change their poses, I practice a 1-minute, a 5-minute, and a 10- to 15-minute sketch. It is indeed an interesting experience. During the first class I was completely intimidated and my hand was shaking as my eyes were just getting used to taking in the proportions from real life to the paper. However, I have gained a little more confidence and my hand is more relaxed now. And most of all, I have tons of fun! It is just such an enjoyable experience to lose oneself in drawing and see shapes appear on the paper. I am learning about proportion, shading, and capturing the energy of each pose. So, while fashion illustration is the focus of my studies, I believe I will benefit from attending this art class as I will develop a skill set that will feed into my fashion design work. More to come! Dress (1968–69) by Zandra Rhodes. The final project of this semester is done! I have been keeping you posted of my progress and projects. I have very much enjoyed the class: Graphic Design for Fashion. I have learned tons about graphics and the role they play in the fashion industry. So, here is the last update of the semester. The final project was to design a collection of graphics to use in a Target collaboration with a fashion brand. I decided to go with Alice & Olivia - a brand known for their lovely patterns and fabrics. Their designs are youthful and and colorful. I reviewed the past Target collaborations and believe that Alice & Olivia would be a lovely brand to work with Target on a capsule collection. For my inspiration I researched a variety of octopi - I love their movement and shape and colors. They would inspire the collection's color scheme and the two graphics I designed. Below you can see the moodboard for this project. Graphic #1 plays on the existing Alice & Olivia logo. I created three colorways and merged it with the famous Target red circle logo. The small circles reference the octopus suction cups and the color scheme goes well with the underwater photos I came across in my research. The collection itself examines how to use these graphics on items Target would sell. I turned the graphics into a pattern, used them on their own, and also made them oversized. Graphic #2 draws on the actual shape of an octopus. Again, I ended up going with three colorways and inserted the Target logo in a subtle way. The Alice & Olivia logo weaves through the octopus tentacles. Like the collection for graphic #1, this collection explores different ways to use the design on a variety of items, such as dresses, tops, and clutches. So, here we are! All set and done and off to relax and start my next class in Spring 2015! Judy Chicago's masterpiece, the "Dinner Party," now has a permanent place at the Brooklyn Museum in New York City! This long-term installation is located at the Elizabeth A. Sackler Center for Feminist Art and it quite an experience. The Dinner Party (1974-1979) is, in essence, a huge ceremonial banquet. It is arranged on a table in the shape of a triangle and has 39 place settings. Each setting is devoted to an important woman from history. Each setting, a masterpiece in its own right, consists of a runner, gold chalice and utensil, and china-painted porcelain plates. This plates are not flat - their 3-dimensional shape is inspired by vulvar and butterfly forms. Each setting in in style appropriate to the individual woman remembered and honored. As you walk around admiring the beauty of every single object in the exhibition, you will also notice the area in the middle of the table. It is made of white tile and contains names of 999 other women. The display is accompanied by a booklet with detailed explanation of each of the 39 settings. You can quickly walk around the area or you can take your time taking in all of the details. This iconic piece of art honors the history of women in Western Civilization. It is as crucial as it was in 1970s as it makes us remember those before us and gives us perspective and strength to make our own futures. In Brooklyn? Have a free moment? Stop by. Photographs by Martina Sestakova. New York City, NY. November, 2014. Henri Matisse may be my favorite artist. I enjoy reading about his life and am fascinated by how he saw the world around him. I got to see his art on display in various European museums and also visited La Chapelle du rosaire in Vence, France. There is a must-see show at the Museum of Modern Art in New York City that looks at Matisse's later works - his cut-outs. The holidays are upon us but when the festivities calm down and you have a chance, definitely make a trip to New York to see this lovely exhibition. "Henri Matisse: The Cut-Outs" is an in-depth investigation of an extremely productive time in Matisse's life. Towards the end of his life, his movement was limited and he rediscovered his passion for color and composition through paper cut-outs. And there are so many on display! People who love art will be so excited to see this show; people who may not be Matisse's aficionados will still find it how really fun. It is all about color and shapes and joy of creativity. A great show for kids too who can enjoy Matisse's playfulness and may end up testing some of his cutting strategies on their own or for a school project. Matisse's work has had an immense influence on the world of fashion. Many designers use his color schemes and cut-outs in fabrics and silhouettes. 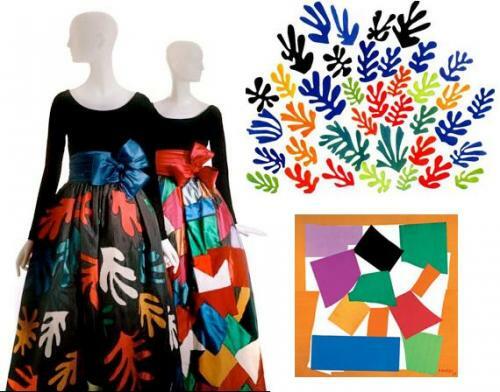 The example below is by Yves Saint Laurent who showed a Matisse-inspired collection in Autumn/Winter 1980-1981. So, whether you are an art lover or not, reserve an afternoon to wander through this show! It is well worth it. Kiss by Auguste Rodin. Philadelphia. January, 2014. Dance and Fashion - What an Exciting Combination! As a fashion designer, I always need to consider the body - how to dress it so it can move freely and how to design clothes that make the wearer feel and look beautiful. On a recent trip to New York City, I got to see "Dance & Fashion" - a fashion show at the Fashion Institute of Technology (FIT). This show investigates both the human form and the beauty of a dance costume. I often think of how a person will live and move in my clothes - all types of motion need to be considered for an effective and appealing execution of a garment. This comes into play even at a greater level in dance. There is certain beauty to the body when it is in motion - this beauty, however, requires special attention from fashion designers. Dancers need costumes that support their bodies and allow for their athleticism to show. Fashion in dance indeed needs to be uncluttered to accommodate for complex movement. Take a look at the costumes below. Aren't they are wonderful combination of design and functionality? FIT displays garments by many famous designers who worked with dance companies. For instance, you will come across costumes by Prabal Gurung, Jean Paul Gaultier (only he could turn a tutu punk), Iris van Herpen, Valentino, Isaac Mizrahi, Versace, or Rodarte. When you see a dance show, do you appreciate the costumes? I find them beautiful and if you have a chance, I recommend you see this exhibition. Valentino, woman’s costume for Sophisticated Lady, Fall 2012, lent by New York City Ballet. Photograph © The Museum at FIT. The show is on view at the Fashion Institute of Technology until January 3, 2015. Twiggy in a newspaper print dress. London, 1967. While I am not focusing my fashion design portfolio on print and pattern making, I do love looking at nature and its color combinations and patterns. On a short walk, you can look up and find amazing clouds. You can look down and see a wonderful texture on the sidewalk. You can get close to a tree and find real treasures in its bark ... The list could go on. So, take a look below and see how I took photos of elements found in nature and how I altered them to create a print. Every time I see something that catches my eyes, I think of it in terms of fashion ... Could it be a fabric pattern? Could I use the color scheme in one of my designs? Do you look around and get inspired by nature? How do you incorporate what you do in your own creative work? Let me know! Afternoon nap. Jamaica. January, 2014. High heels are a staple of the fashion industry. They are loved; they are hated. Some claim they make women look more beautiful; others talk about female objectification. High heels are a complete topic. As such, they are at the center of attention at "Killer Heels: The Art of the High-Heeled Shoe", an extensive exhibition at the Brooklyn Museum in New York City. As you wander through the show (I had the chance earlier in November), you will learn about the history of the high-heeled shoes across different cultures. You will see designs by famous shoemakers, such as André Perugia, Delman, Pietro Yantorny, Enzo Albanese, or Bernard Figueroa. And you will be exposed to many different views on the role of these shoes in our world. The show has several short movies, which add wonderfully to the learning experience. Snippets from "Marie Antoinette" and "Memoirs of a Geisha" hint at what shoes used to be and how they played an important social and economic role. Architecture and innovation in materials and technology represent another section of the show - you will see innovative designs that pay homage to newest in plastics and metals. New York's skyscrapers and their architectural elements can also be detected as an influence in shoe designs. The future of the high-heeled shoe is also represented. Think of Iris van Herpen and her take; see the silver layered (3-d printed) shoes below. Strong colors and innovative shapes and new takes on the shoe are being developed. In all, "Killer Heels' is a wonderful exploration of this iconic shoe and its role in our lives. It is an exhibition that will appeal to all; it is an invitation to learn about this intricate topic. The show is on view until February 15, 2015.